Even if the temperatures have decided to go back to much colder levels this week, there is a spring garden blooming in my studio! 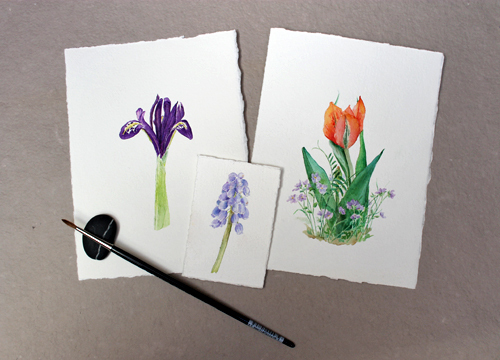 Here is the dwarf iris I finished this week (there are more details than the last time you saw it) as well as a tulip and muscari stem I painted last year. 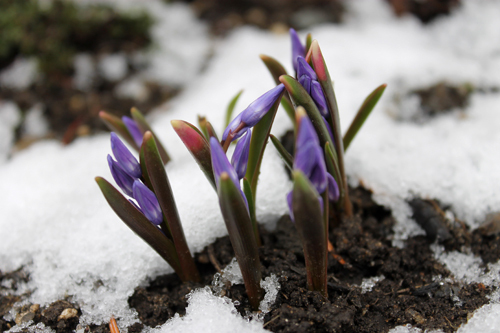 Soon my dwarf irises outside will be surrounded by botanical tulips and a dense carpet of fragrant muscari (also known as grape hyacinth). 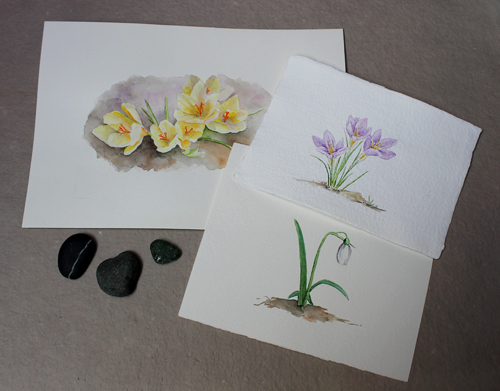 At the top left are the yellow crocuses I finished earlier this week, along with the purple crocuses painted last year and my snowdrop which I painted back in 2008. I painted the snowdrop after a long creative hiatus and I remember Emma asking if she could bring it to school at the time. She actually wrote an English paper about it. I was very touched. This morning, we woke up to a blanket of snow. Actually some of our family members saw it in the middle of the night, as my husband took Chloé to the hospital yesterday evening to see if her finger was broken. She injured it in gym class while playing basketball. They didn't get back home until 2:00 a.m.! The good news is that her finger is not broken, just bruised. They both said they were a little surprised to emerge from the hospital and see snow! 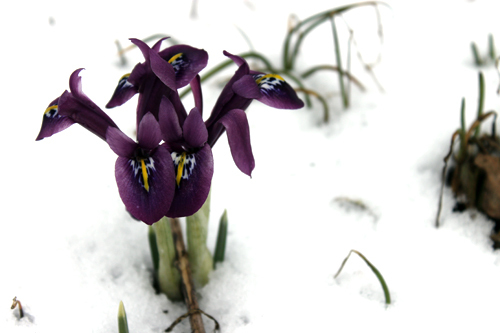 I think my flowers were a little surprised to wake up with a snowy cover too. 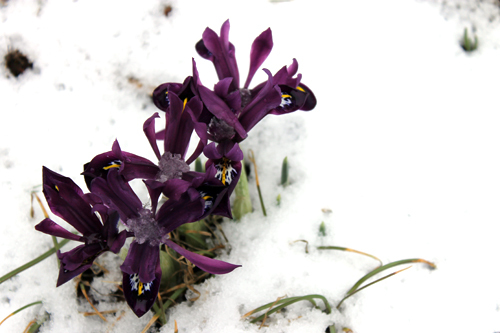 The dwarf irises above seem to be snuggling for warmth. 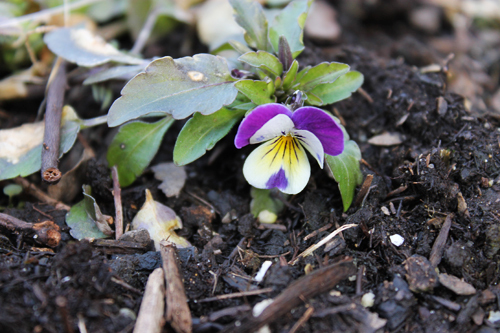 All of the flowers in bloom right now are quite tiny and close to the ground. 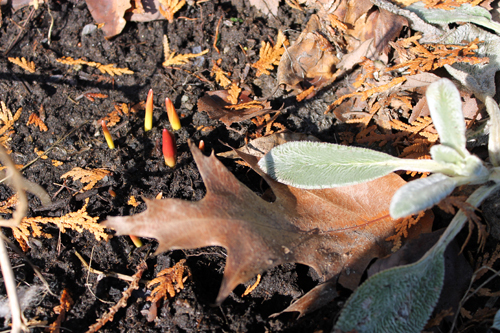 The larger, taller spring flowers will follow. Part of me wanted to run out and put little sweaters and scarves on them all, but I know that they will be fine. 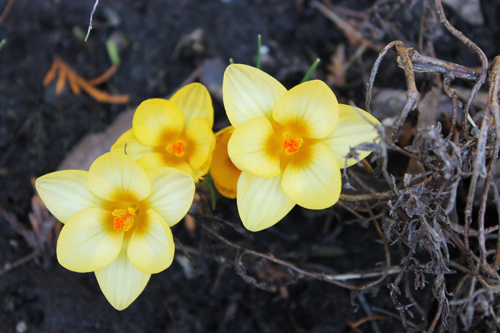 Spring flowers are very hardy and are used to changeable temperatures. Good thing! 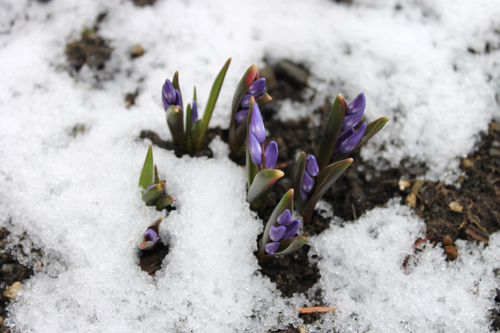 Although I was definitely disappointed to see the return of the snow, I have to admit that it is a pretty backdrop for spring flowers. I can see some potential paintings in these photos. 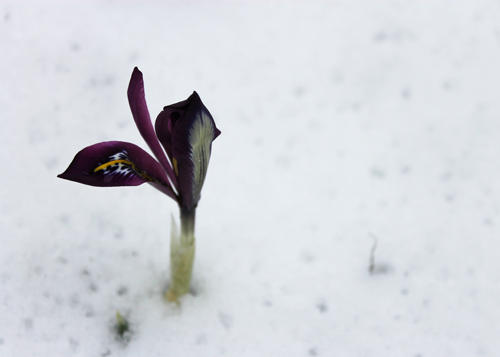 Yesterday I brought a couple of the dwarf irises indoors to use as models. These guys are definitely tiny. I used a small liqueur glass for a vase. I have been feeling physically under the weather the past few days, so sitting and painting will be the perfect activity and now I have plenty of inspiration. Walking away from something temporarily can sometimes be a good thing. 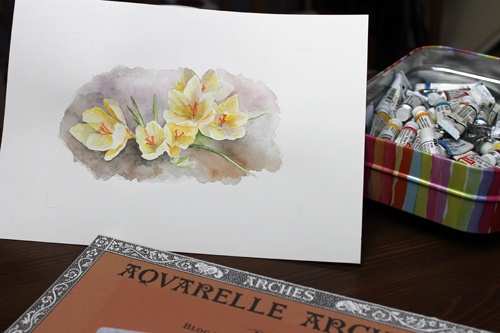 The crocus painting that I showed you in my last post did not end up in the garbage after all. This is the point it was at when I was going to give up on it. I went back to work on it yesterday afternoon and today. Now am feeling better about it. It is back to being quite cold here today. 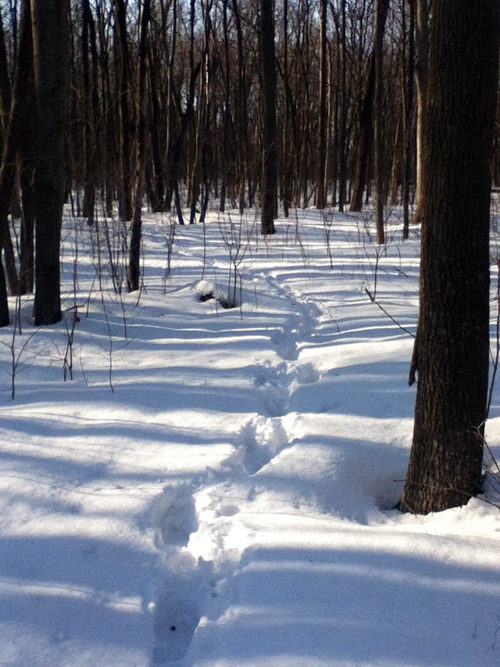 Last week, people were wearing shorts and sandals here. Today I was back in a winter coat with a scarf and gloves. But I don't mind. With cooler, more normal spring weather, the display in my garden will last longer. 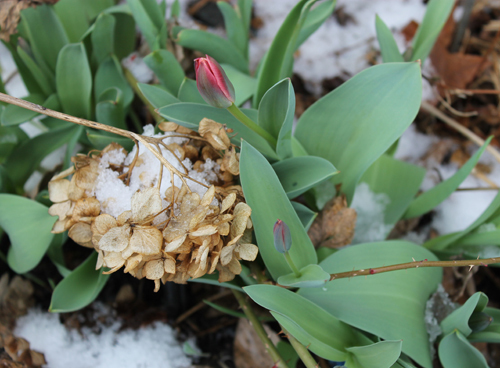 The way it was going, summer was going to arrive before spring even had a chance! 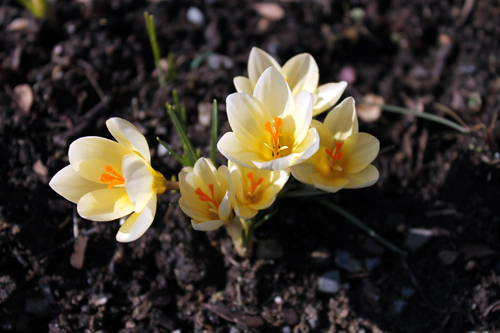 Here's a quote I found today that works quite well with my crocus painting challenge. Where did the week go? I am very tired, so know that I was very busy yet I certainly didn't get a lot of painting done. 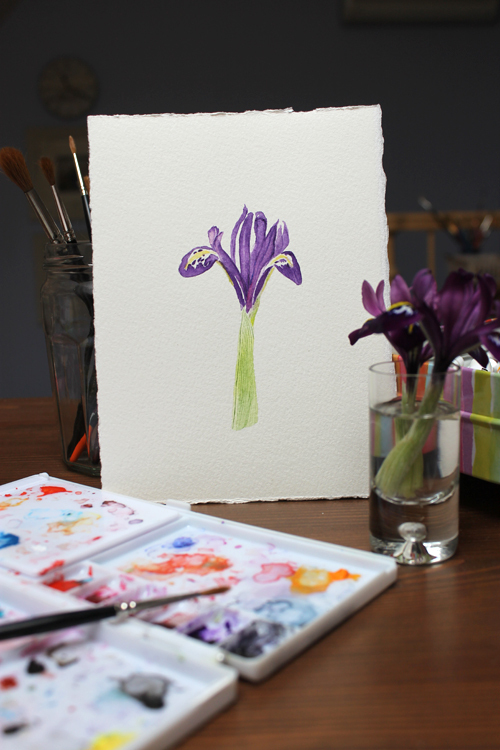 I started a painting of crocuses a few days ago. 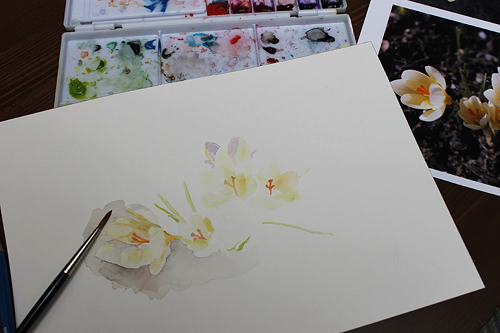 I chose hot-pressed paper, although I usually use cold-pressed to paint on and either it didn't agree with me or I didn't agree with it. I seemed to be fighting with it. Finally I walked away from my work in progress in frustration. I often feel frustrated while I am in the middle of a painting. Every painting contains myriad up and down moments as the paint, water, paper and I conspire to create an image. I'm used to that, but it's very rare for me to give up on a painting. Because my week contained more non-painting moments than painting ones, I thought it would be useful (maybe you're too driven? too prolific?) to put together this list. 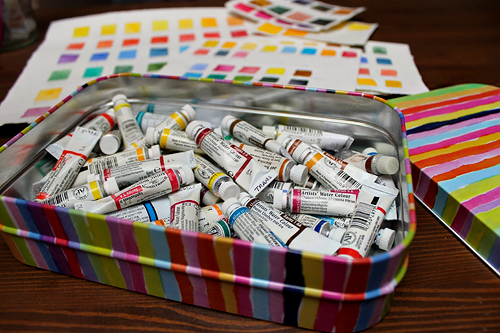 Make beautiful colour swatches of all of the paints in your paint box. 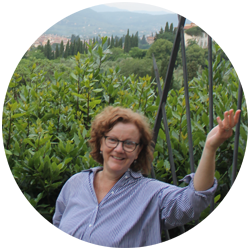 Spend days on the Handprint site (an amazing resource!) and stay so long that you become artistically paralysed. 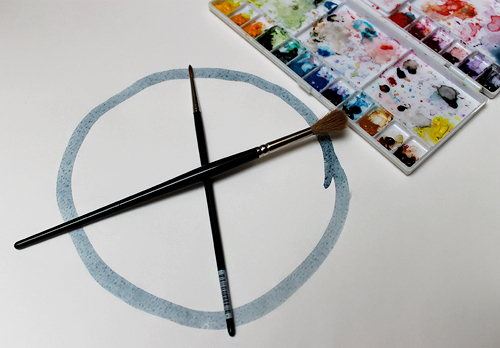 Revise your palette based on all of the information that you learned during your days spent on the Handprint site. Make new colour swatches based on your new palette. 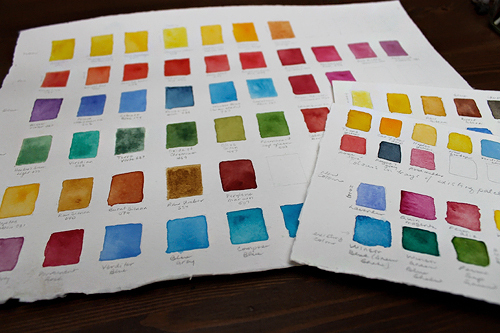 Reorganize your watercolour paper in your studio. Have another cup of coffee or maybe a cup of tea. 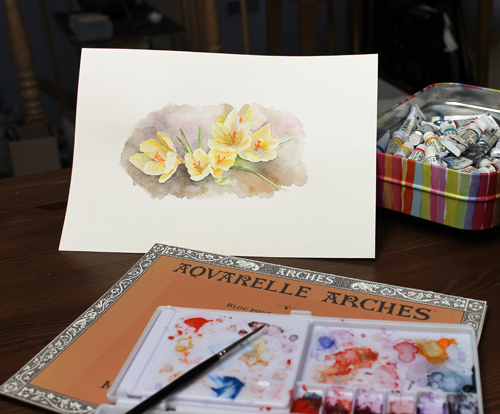 Decide that your many years of painting experience are not enough and reread all of your art instruction books, watch how-to paint videos on YouTube and visit other artists’ websites. Take photos of potential painting subjects. 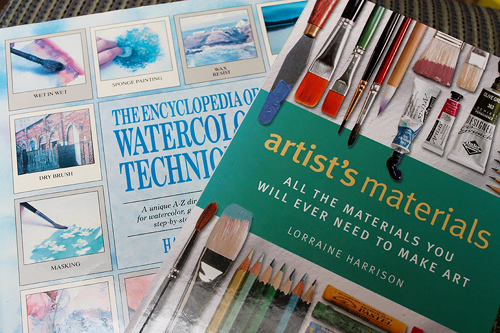 Go to the art supply store to find inspiration in new art materials. Decide that you should devote your energy and time to the art of housework. Redecorate a room, refinish a piece of furniture or build something. Check your email, blog, Etsy shop, Facebook page and Twitter feed. Take the dog for another walk. Write a blog post about not painting. 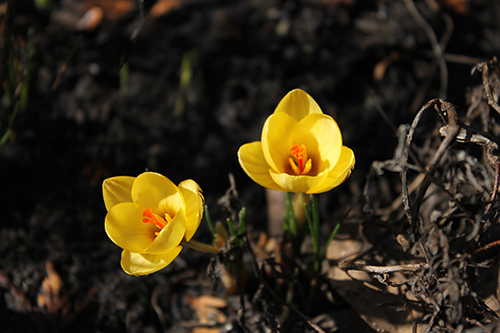 Welcome Spring! Thank you for arriving in such a lovely way this year. 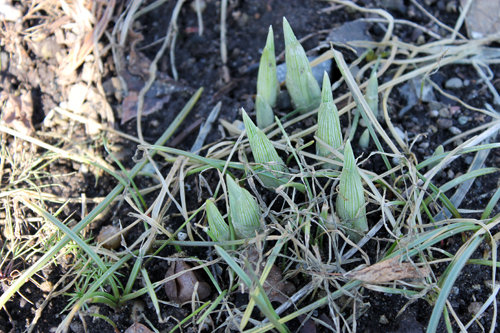 My garden is coming alive and my heart is full of renewed promise and hope. I love this time of year! 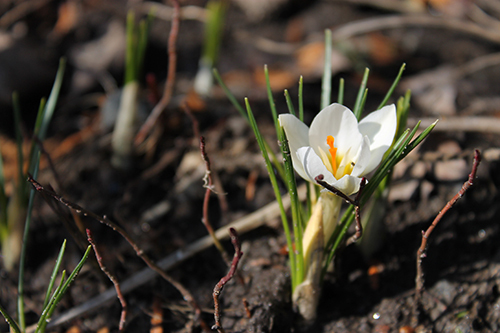 I love this moment of every year when the first spring bulbs bloom in my garden. Talk about joy. Today is an unseasonably warm day. 20C in March. Glorious. 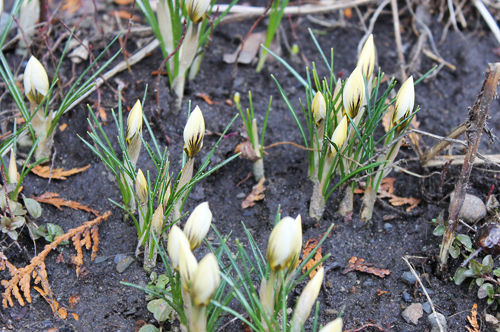 Despite the early warmth, my crocuses aren't that far off their regular blooming schedule. I always write the date on my calendar. 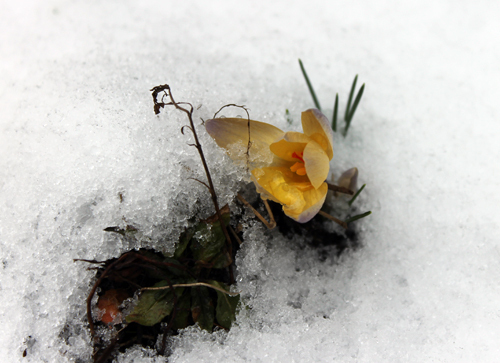 Last year, the first crocus bloomed on April 1st. In 2010 it was even earlier--on March 15th. No matter what the weather is in the upcoming weeks, warm or cold, it means we have turned the page. 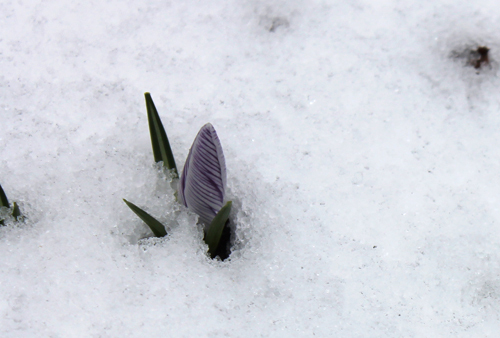 I think I might paint some crocuses this week. I hope you are all having a lovely weekend. Meeko is two years old today. 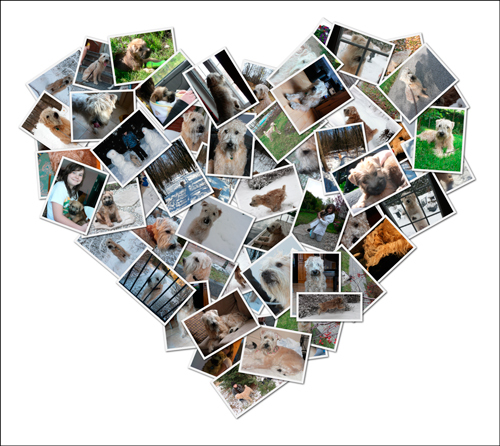 I made a collage of photos to commemorate the occasion because there aren't enough words to describe how much I love him! Chloé and I just took him to the pet store to choose a birthday gift. He chose a plush animal and a rope toy. He was very excited about both and ran around with them for a few minutes. Now he is chewing on a stick. You know, the free kind that you get outdoors. So much for shopping. I wanted a dog forever (we always had a dog when I was growing up) but not everyone in my family felt the same way. I waited a long time for this dog. I'm happy to say that this furry, mischievous boy has won everyone's heart. (He had mine from the start.) He is smart. He is goofy. He is joyful. It's a pretty wonderful combination. He's changed a little bit since this photo was taken but those eyes haven't. 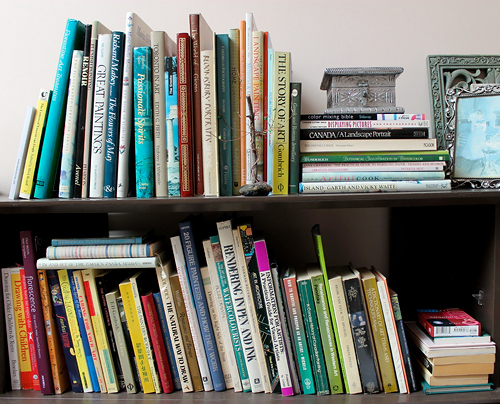 A little peek into part of my studio. 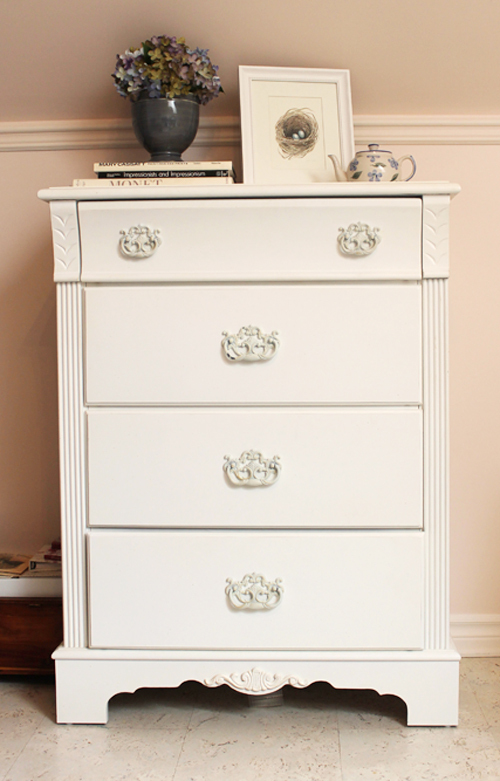 This is the chest of drawers that I use to store my paintings and art materials that aren't in use. The beautiful nest painting is by my friend, Canadian artist Jody Edwards. 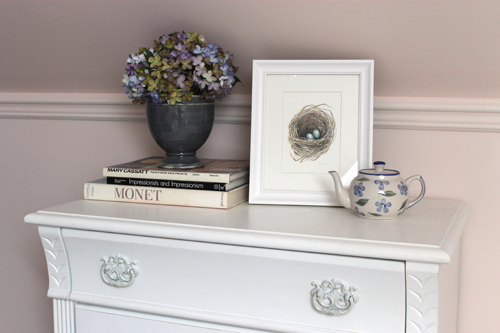 Because most of my paintings are very small, it is easy for me to store them in a piece of furniture like this. 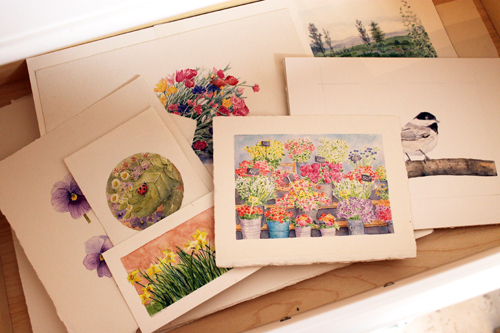 I have a few larger paintings that I store in portfolio cases. 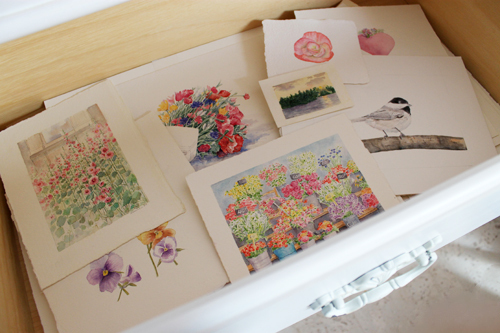 The bottom drawer contains paintings done by Emma and Chloé. Here's a little look at some of my paintings. I've spread them out for the photo. I usually have them stacked in piles according to their size. My studio is in a loft on the top floor of our house. Because it is a loft, the ceiling is sloped. That means I can't put any tall furniture against the walls. I was really happy to find this chest of drawers that was exactly the right height. I painted both the walls and ceiling a peachy rose colour several years ago. I still like the colour but I think I would prefer a light periwinkle blue (my favourite colour) if I was to do it again. I'll show you more of my studio soon. I still have a lot of things to organize that are taking up room on part of the floor. I have been going through a number of my paintings today (none of which are in the photos above) trying to decide which ones I would be willing to sell. So some of my paintings may have new homes soon. I'll share the details here once I'm organized. This past week was an odd one. Both Emma and Chloé had their spring school break. Chloé ended up sick for half of it. So, many plans for the week were set aside. She perked up towards the end of the week. I was able to go downtown shopping with her for a spring coat on Thursday and with Emma for her high school graduation dress on Friday. Both daughters present their own shopping challenges. Chloé likes shopping (a little too much) and Emma doesn't like it (at all). 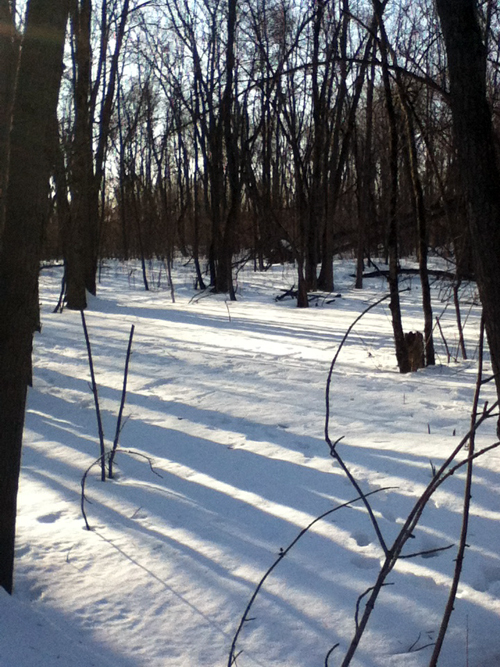 Both expeditions were very successful although I felt like taking a nap after each of them! 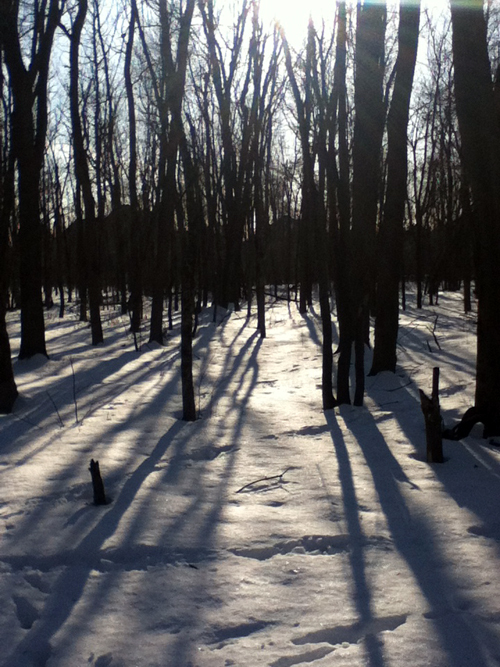 On the weekend, we also managed a short trip to Trois-Rivières to visit my husband's mother. Over the past week, I came to truly appreciate the power and immediacy of Facebook for the first time. My 16-year old niece is on a school trip in Africa and I have been able to chat with her on more than one occasion. It sounds like she is having a wonderful experience. She even said that she had taken a photo of an African village garden with me in mind. I was very touched. On the art side, I didn't get any painting done but I added a few new prints to my Etsy shop at the beginning of last week. I also had someone inquire if I sold my originals which has launched a huge wave of thinking. I have sold many original paintings in the past but haven't for the last while and never before online. My paintings tend to be small but I can spend days on them. 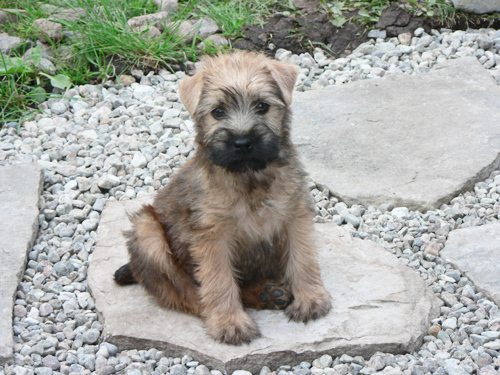 Sometimes making the decision to sell them can be difficult as I become very attached to them. I've talked to a number of people in the past few days--fellow artists, friends and family members--trying to figure out which ones I would be willing to sell and the best way to go about it. Chloé, who is 12, has offered wise words on more than one occasion. It's interesting and quite wonderful when you start to receive sage counsel from young family members. I'll keep you up to date here and on my Facebook page. 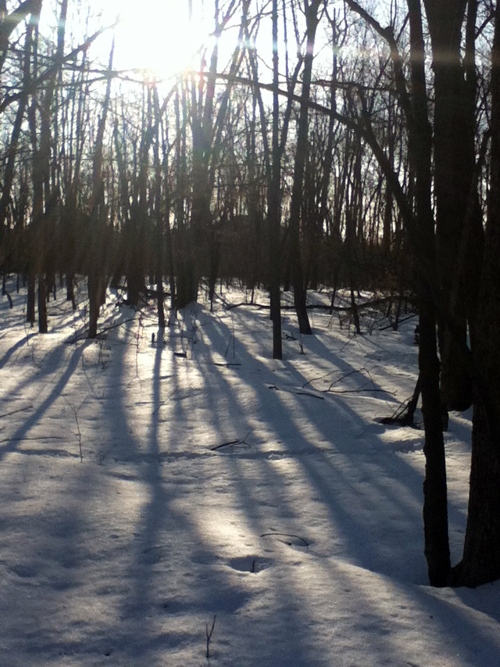 This past weekend has brought warm weather that is melting the snow. Hurray! 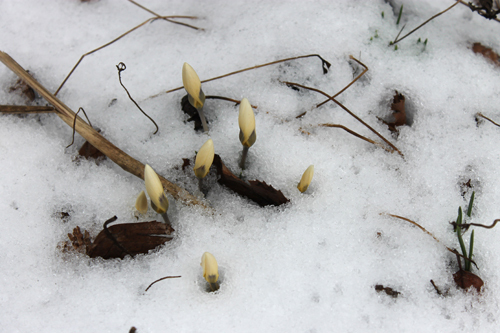 Some of my flower beds are still covered but they won't be for long. There are warm temperatures predicted throughout this week. 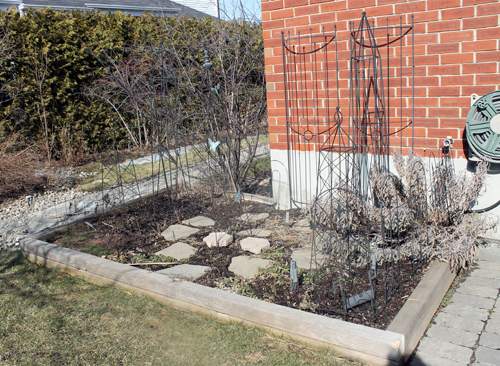 I took a photo of my raised vegetable bed yesterday (the photo at the very top). 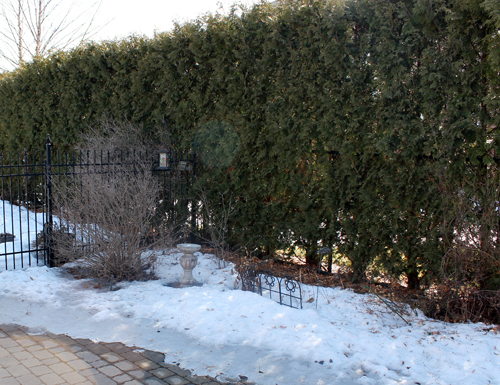 It doesn't look like much at the moment, but I look forward to showing you its progress and evolving prettiness throughout the growing season. I'm very fond of it. 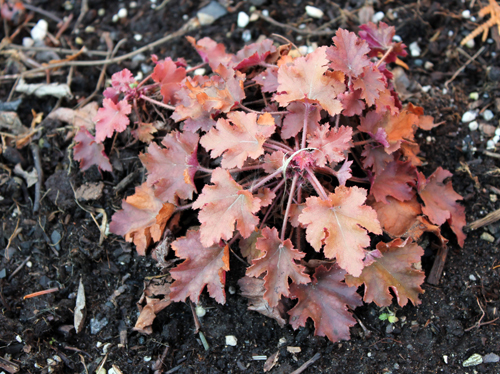 It's a 'square-foot garden', a lovely idea for gardens with limited space. 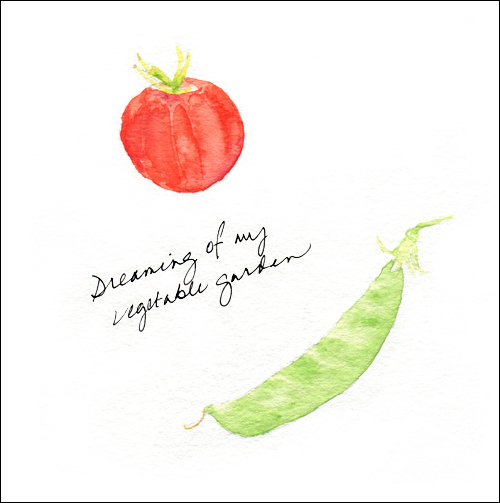 So along with dreams of flowers, I have dreams of vegetables these days. A little watercolour sketch I did of a cherry tomato and pea pod from a past harvest. I have been working so hard lately trying to get more prints into my shop. I'm pretty happy with my progress. Each painting offers its own challenges when I try to convert it into print form while trying to be as true as possible to the original. My perfectionism helps and hinders me along the way, if you know what I mean. 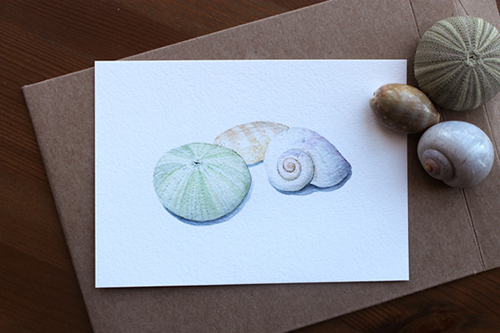 My most recent additions are prints of my seashell and snowdrop paintings. 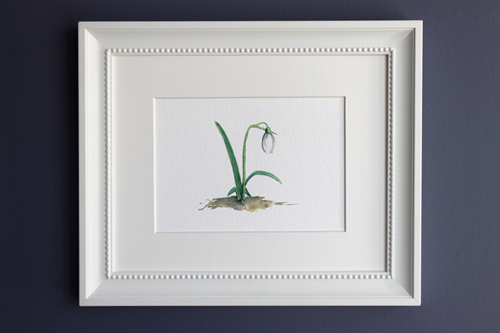 You saw the seashell painting as it was in progress but I'm not certain that I've showed you the snowdrop painting here before. It's actually the prints that are in these photos. 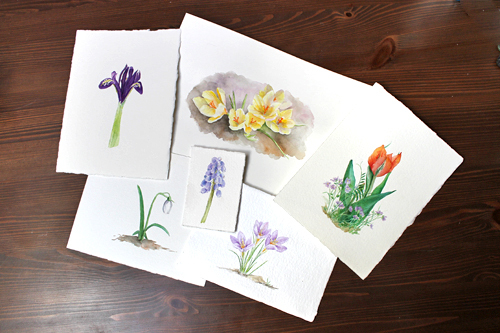 While everything I have added to my Etsy shop lately speaks of spring and summer, we are still surrounded by snow. It won't last long as the temperatures are supposed to climb tomorrow and Thursday. 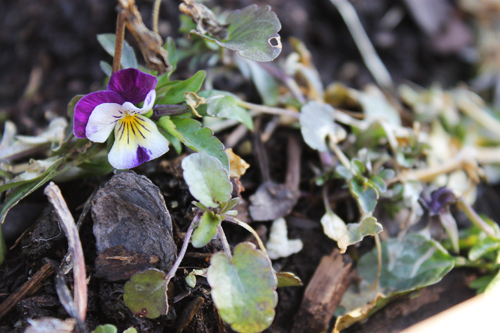 This is the time of year when I flutter between not being able to wait one more moment to see my garden, to sadness at saying goodbye to winter. 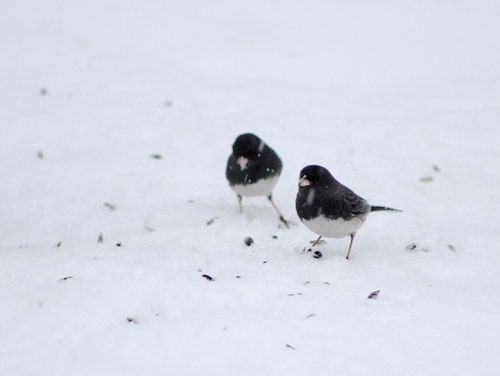 This photo of my sweet dark-eyed juncos was taken in late February (the same day that I took all of the cardinal photos). 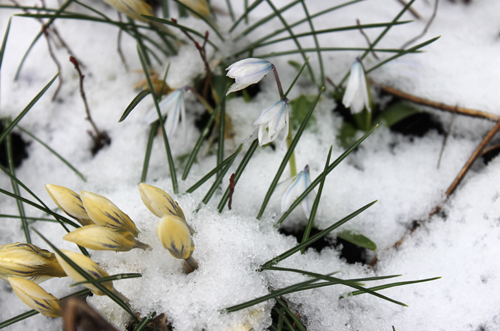 I'll miss how beautifully they contrast with the snow. 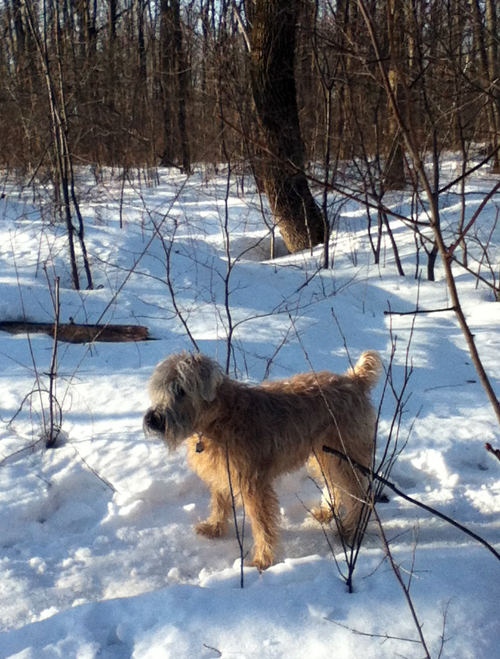 When Meeko and I went for our walk this afternoon, we were both walking a little slower than normal--maybe to savour the last days of the season. 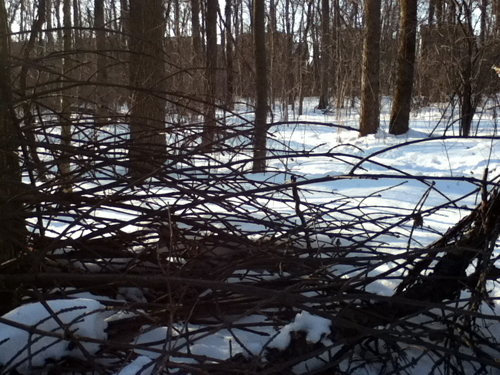 The following photos were all taken with my iPod Touch this afternoon. This week is the March school break for Emma and Chloé. Chloé unfortunately has ended up sicked with a fever and sore throat. She is quite annoyed to be sick during her vacation and I can totally understand. It happened to me so many times when I was young. I would be sick on weekends and vacations and hardly ever missed school. She is starting to feel better so I hope to do a few things with Emma and her during the vacation that's left. Not that they haven't enjoyed pajama days, Tumblr, t.v. shows and movies. If I've missed visiting your blog recently, it's mostly because my routine has been off its normal track. They go back to school on Monday. I hope to get back into my studio then to do some more painting.